Again [Jesus] said, "Peace be with you. As the Father has sent me, so I am sending you." So often in our world, peace is a selfish retreat from the world. 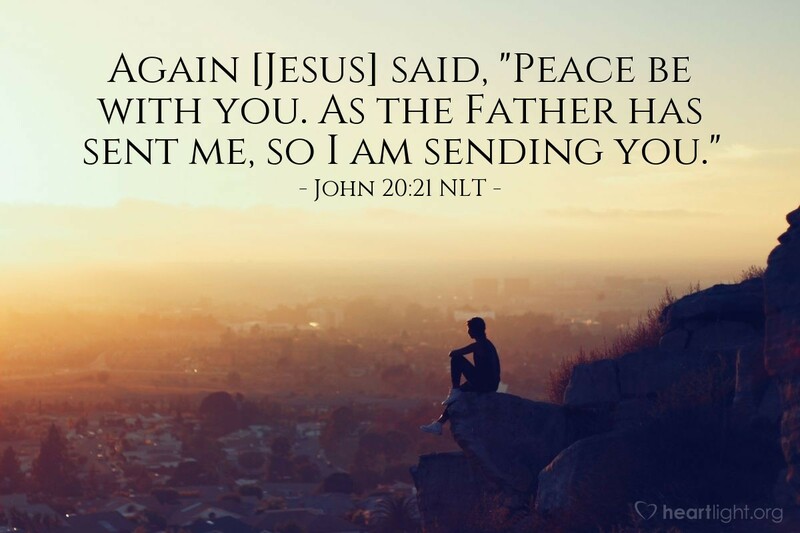 For Jesus, peace was something he received from his times of rest with his Father so he could go back and minister to the world. Jesus calls us to find our peace in him — a peace rooted in his defeat of death, his presence in us through his Holy Spirit, and his assurance of our future with him. That peace, however, should fuel our passion for doing the work of Jesus and for being sent by him into the world to bless it with his grace. Father, please fuel my passion for touching the lost and broken around me with the grace of Jesus. Give me the peace of your dear Son so that I, too, will go to bless a fractured world. In Jesus' name, I pray. Amen.